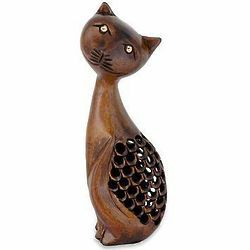 With an elongated style reminiscent of mid-century pieces, this cat is a retro decor accent carved from kadam wood. The body is hollow and is carved out in a style that may remind them of fist scales. Deals on Best Sellers with Exclusive Online Offers.